Nothing makes you feel like the nebulous King of Miami quite like standing at the edge of this bar on the 31st floor of the EPIC. Of course, going here on a Friday night means you’re sharing that “King of Miami” feeling with about 200 other people, all of whom probably have the same thought. That’s nothing new in this city, so check your ego, grab a Plantation -- a cocktail featuring peppercorn-infused Brugal extra-dry rum, coconut white balsamic shrub, lime, honey, and ginger beer -- sit by the pool, and appreciate the fact that you can do all of this in February. When your pool is tabbed as having one of the best hotel pool views on the planet by the worldwide leaders in pool viewology (a very real, meticulous science), of course you need to be slinging some serious drinks to go along with it. Though this spot -- which in a previous life was home to one of Miami’s craziest Sunday pool parties -- has calmed down as part of the eco-friendly 1, the bar is still the most scenic on the beach. In one direction, you can see clear out into the Atlantic, and in the other you’ll see the expansive Miami skyline, combining the feel of urban rooftop, ocean view, and trendy pool bar in one sun-soaked patio. The Pubbelly boys could probably open a DMV and it would still be a phenomenal place to spend a few hours... which is why it should come as no surprise that their new venture on the roof of the Langford Hotel might be the best new bar of 2016. Not only does it boast a panoramic view from the middle of the Miami skyline, but Pawn Broker’s serving up spectacular drinks in inventive containers. Best example: the Giggle Water, a gin, Champagne, syrup, tonic, and lavender foam mixture served in a mini bathtub. It tastes like drinking a bubble bath, in the best possible way that would taste. 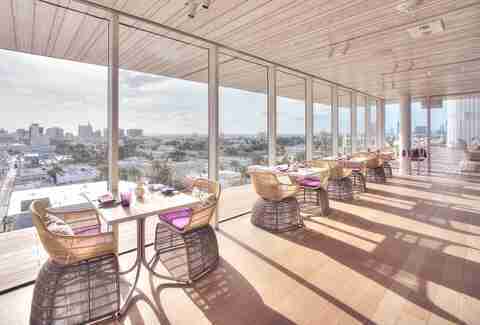 The restaurant on the top of the 1111 garage in South Beach might be THE best date-with-a-view spot in Miami. That said, it’ll also put a bigger dent in your wallet than an unexpected FPL bill. For all the romance and a much lower bill, hit this place for drinks. Try a Purple Juvia -- Belvedere, chambord, blackberry, and lemon juice -- relax by the ivy-covered wall outside, and enjoy the award-winning design and views of the ocean. Nothing is quite as relaxing after dropping all your money at E11even than a retreat to the bar upstairs. You can stare out towards Downtown, feel the cool breeze blowing down NW 11th Street, and enjoy an ice-cold beer. Then, once you’ve taken in the sights and regained your composure, you can either enjoy some food, or go back downstairs and continue with your bad decision making. Sometimes, you just need to live like a tourist to remember why you live here. And while it may be embarrassing for a salty local like yourself to voluntarily go anywhere on Ocean Drive, an afternoon spent at the Clevelander’s rooftop bar is like a mini staycation. As you gaze out at the turquoise waters of the Atlantic Ocean, the Art Deco hotels along Ocean Drive, and the city behind you, you remember the magic that first brought you to this weird beach city. And for those few hours you spend enjoying the Miami you often forget, it almost makes the traffic, humidity, and undependable people with jobs that make no sense seem worth it. 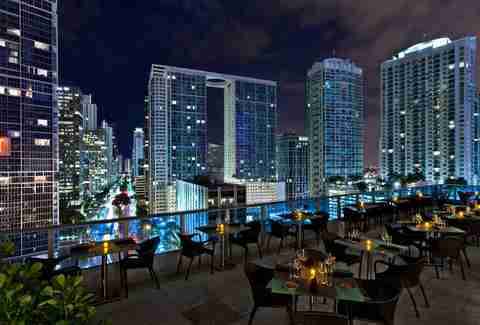 High atop Brickell’s swanky new East hotel sits the city’s premier rooftop bar, with views far out across Biscayne Bay to the east, north to Downtown, and south to the shiny glass and bright lights of Brickell. 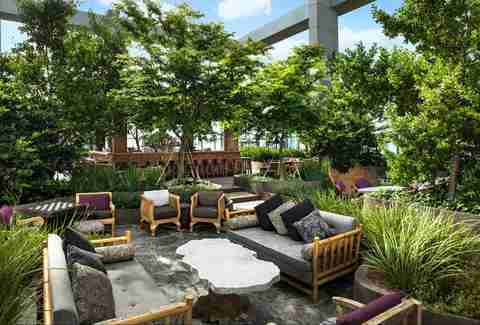 Simply sitting in this Balinese garden in the sky is one of those magical Miami moments that makes you glad you live here. But when you wash down some of their spicy boneless Korean wings or lamb satay Madura with spiced peanuts with a lychee blossom -- Russian standard with sake and lychee -- you’ll realize why people still manage to fill all the condos that surround you. 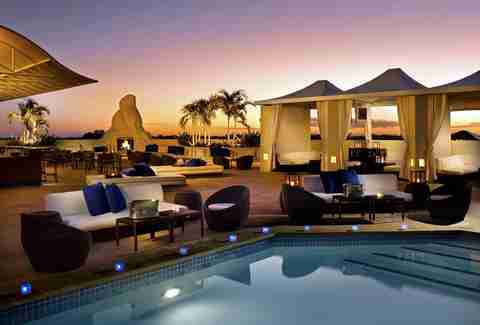 When the W took over the old Viceroy in Brickell last year, chief among its changes was revamping the old Club 50. The place was gutted and redone in bright Miami whites and a grained marble floor. 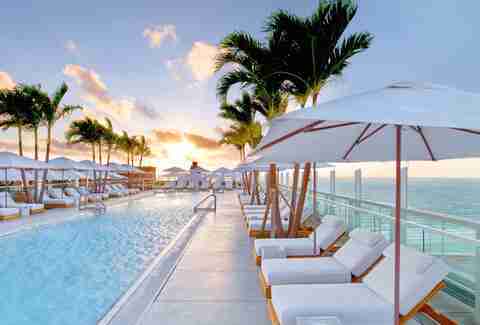 It’s now the picture of Miami opulence, where at night you can sip cocktails and feel like you rule the city, and by day can visit the bar near the adjacent pool. And for those who’d been in the last few years of Club 50, the crowd, like the décor has improved. 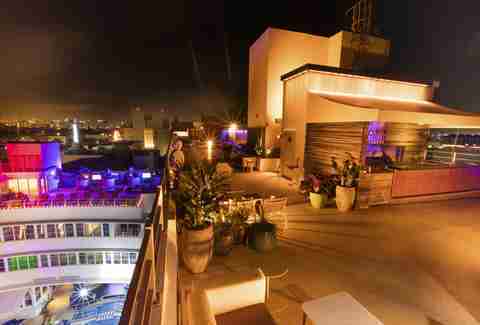 Probably the most underrated and under-attended rooftop bar in Miami sits atop one of its most classic hotels: the tropically regal Mayfair. Here daybeds and lounges surround a turquoise pool, and the bar affords views out over Coconut Grove and the sailboats on the water beyond. For delicious cocktails, water views and not too many people, nowhere in Miami has it beat. 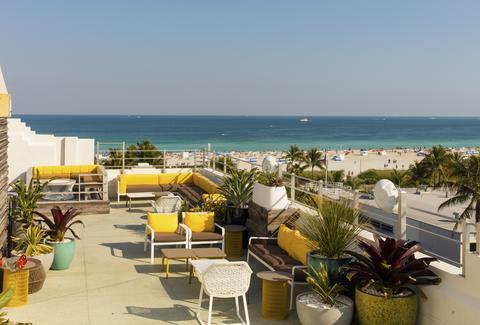 Broward’s best entrant to the rooftop pool game is, not surprisingly, at the W in Lauderdale Beach, where you can sip cocktails and look out at the Atlantic and the mayhem on A1A below. The recently renovated elevated pool deck has added a full poolside bar, daybeds, and an art-deco black-and-white tile floor. And while it’s also bound to be a destination for more than a few out-of-towners, it’s still a relaxing place to enjoy a drink.